Clearly, for most dialects of English, we can say that 1 is grammatical and 2 is not. In accounting for this, all theories of language must assume that the words carry certain information. No one would deny that a verb such as walks somehow needs to combine with a compatible noun phrase. This form of attraction is normally referred to as SUBCATEGORIZATION. Let us say that we have information in our mental lexicon and that it looks something like this. Of course we don’t have this information written in words. In fact, we don’t have any idea at all what it might look like in our heads. 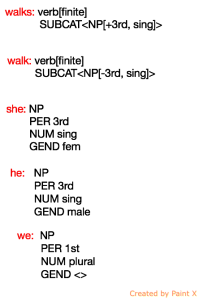 Even so, let us say it looks SOMETHING like this, and don’t forget that ALL theories of syntax have to assume lexical information of this sort. 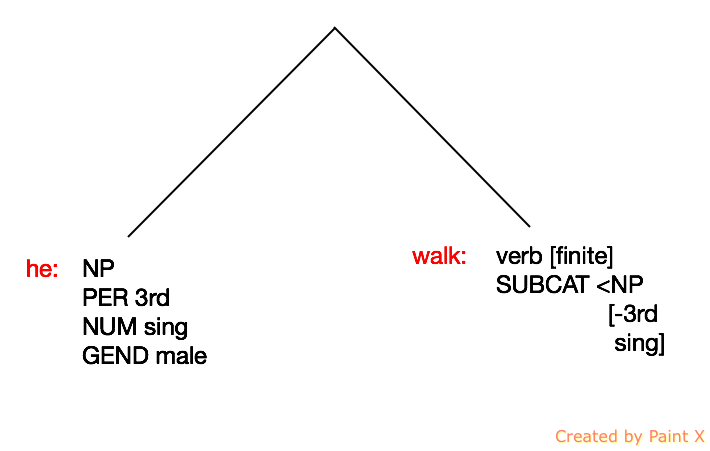 A verb such as walks really wants to attract a [3rd, sing] NP. We could say it has a positive attraction for [3rd, sing] NPs. So it attracts NPs such as he, she, a cat, John, and so on. 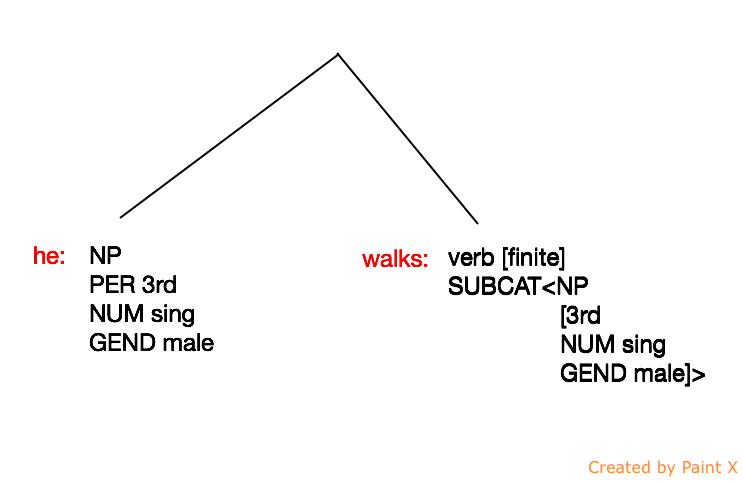 However, verbs such as walk have a negative reaction to such [3rd, sing] NPs but don’t mind combining with anything else. Now let us say that, when the two words “He walks” combine, the information carried on both words starts to match as much as possible. So, for example, information about the subject carried by the verb will grow to match the information carried by the subject. 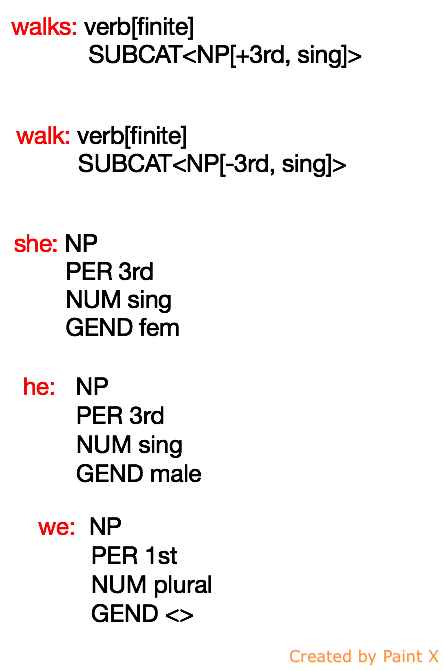 So now information on the verb will include the fact that the subject is male. That is feature structure sharing. 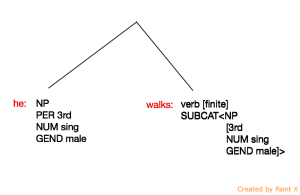 While other theories (like transformational approaches) need Phrase Structure Rules PLUS some kind of matching operation PLUS — for example, movement — unification grammars have ONLY Phrase Structure Rules PLUS this kind of operation. This is NO GOOD. When words like he and walk try to combine, walk will have a negative reaction to he and it will not be possible to structure share. The feature matching procedure allows unification grammars to have no movement operations at all.